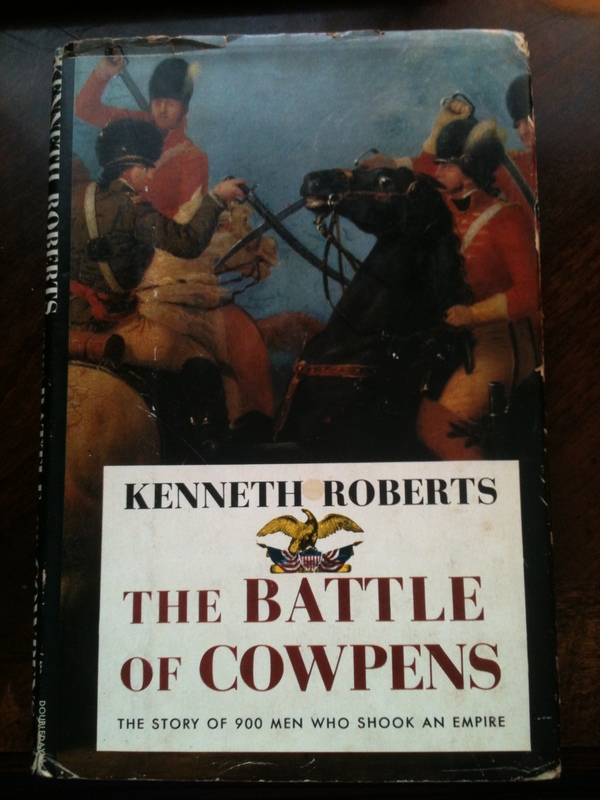 The first book that I want to highlight in the series titled “Kenneth Roberts First Edition Books” is Battle of Cowpens: The Story of 900 Men Who Shook an Empire. This is the only book that was not published by Kenneth Roberts as it was published posthumously after Roberts’ death on July 21, 1957. Boon Island and Battle of Cowpens were Roberts’ last two novels, but his first two novels following his venture with water dowsing. After publishing Lydia Bailey, Roberts shifted his focus to promoting the validity and value of water dowsing and wrote Henry Gross and His Dowsing Rod (1951), The Seventh Sense (1953), and Water Unlimited (1957). According to Jack Bales in Kenneth Roberts, Collier’s magazine approached Roberts’ representatives at Doubleday to see if he would be interested in writing a 4,000- to 5,000- word article on the Battle of Cowpens (Bales, 115). Roberts agreed and published his article in 1956. His work for the Collier’s article motivated Roberts to write a novel on General Daniel Morgan (who commanded the 900-man American army against the British at the Battle of Cowpens). Unfortunately, Roberts died while his work was in its research stage. Bales quotes Roberts’ secretary as stating that “‘Any plans for such a book were in Mr. Roberts’ head at the time of his death'” (Bales, 115). Before Roberts’ died, however, an old friend, Herbert Faulkner West, approached Roberts about publishing his Collier’s article in a limited edition book form (Bales, 116). Roberts would not live, however, to see this book. West wrote the forward for Battle of Cowpens, and in the spirit of Kenneth Roberts, Marjorie Mosser Ellis (Roberts’ niece and secretary) complained to Doubleday for allowing West’s “negative” forward to be included with the book (he had negative comments about Northwest Passage, Boon Island, and his three water dowsing books [Bales, 116]). Further, Moser corrects West in that Roberts did not rewrite Battle of Cowpens for West; rather, Collier’s “hacked” Roberts’ article to pieces and the book form represents Roberts’ work in its true form (Bales, 116). Lastly, Bales notes that while Battle of Cowpens exhibits Roberts’ attention to detail and illustrates his in-depth historical research, it does not flow smoothly. One reviewer also points out various errors in Roberts’ work – errors that Bales assumes (correctly, in my opinion) that Roberts “would have corrected these if he had lived to complete his project” (Bales, 116). No doubt had Roberts lived, Battle of Cowpens would have fit Roberts’ mold of a historical fiction novel (Bales, 116, quoting from Howard H. Peckham, review, William and Mary Quarterly 3:15 : 530). Earlier in my collecting days, I was unsure about the status of Battle of Cowpens; that is, I didn’t know if it was published alone or if it was published in a set. About 10 years ago or so, I found a four-volume set of Kenneth Roberts books, and the title of the set was Kenneth Roberts Reader of the American Revolution published in 1976. The set included Arundel, Rabble in Arms, Oliver Wiswell, and Battle of Cowpens. Since then, I thought that Battle of Cowpens was available only this four-volume set. Later I became aware of the fact that Battle of Cowpens was published by itself shortly after Roberts’ passing. 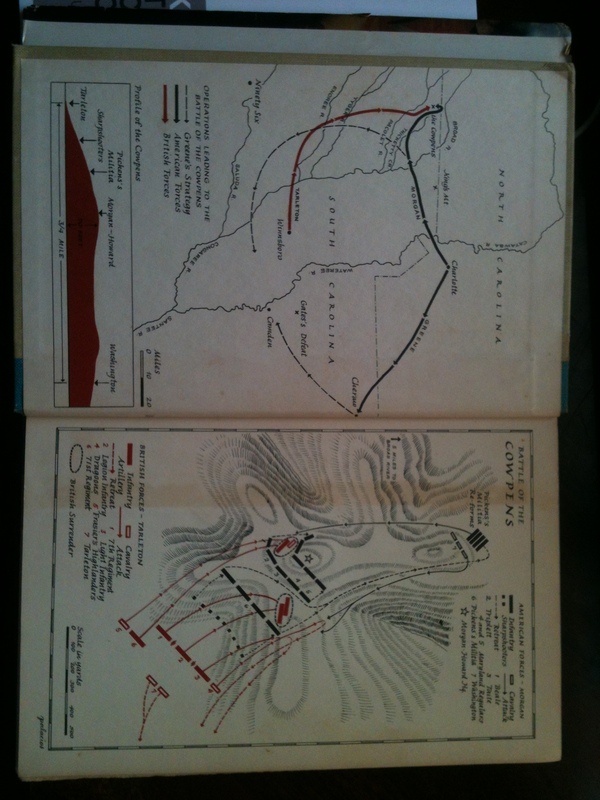 Below are some pictures of the dust jacket, the maps on the end papers, and the copyright page. Note that the copy I bought is the first trade edition; Roberts had a limited number of copies published and each one was signed – I hope to get one of these copies eventually. Notice that the copyright is to Kenneth Roberts’ estate. To my knowledge, the bank that managed his estate is no longer in existence. 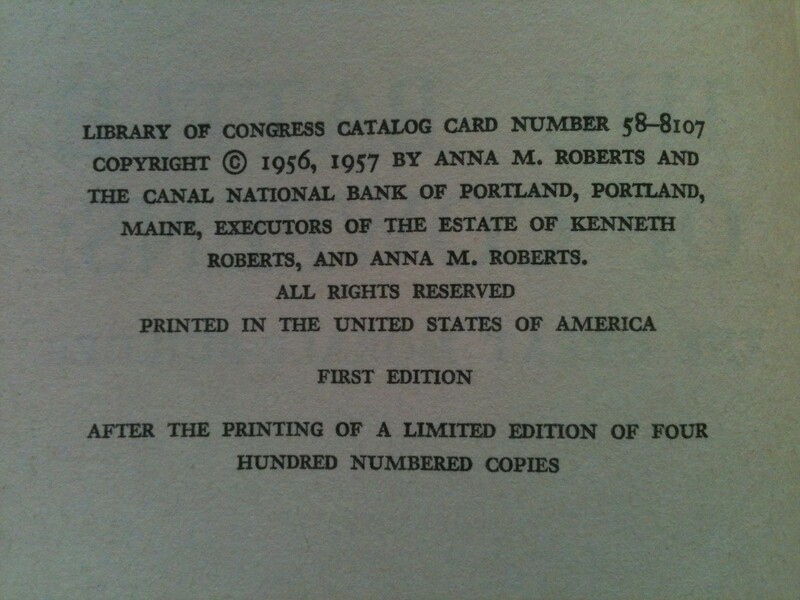 I am currently trying to track down who holds the rights to Kenneth Roberts’ estate. I’ve actually been thinking lately of reading more historical fiction novels, but I’ll be honest, I’m rather hesitant to do so because I am unfamiliar with any other historical fiction writer. Hopefully, this blog can rescue me from the doldrums of ignorance. Back in 2011, “Historical Novels” provided a favorable post for Kenneth Roberts’ Arundel, which you can read here. A link is also provided for what looks to be a very promising website: historicalnovels.info – a website that lists over 5000 historical novels. Characters bearing the surname of Towne or Nason serve as either the main protagonist or play a central role in most of Kenneth Roberts’ novels. For instance, Langdon Towne was the central character in Oliver Wiswell and Steven Nason was the central character in Arundel. Roberts use of these surnames exhibit not only his attention to historical detail, but his desire to link his works to his New England ancestors. Some time ago, a Kenneth Roberts fan mailed me some information he received when he attended a presentation by Jack Bales at the Brick Store Museum in Kennebunkport, Maine. Among the material sent was a short genealogy of Roberts’ family. Interestingly, Roberts follows his family history from his mother’s side; none of the characters in Roberts’ books are based on ancestors from his father’s side. Various reasons are plausible for such an exclusion. Jack Bales in Kenneth Roberts states that little is known of Roberts’ father (and even of Roberts’ immediate family [Bales, 1]) and that he “was not at all close to his father and never mentioned him in any of his articles or books” (Bales, 2). It’s unknown why Roberts was distant from his father, but one can speculate that his father’s job as a traveling salesman played a significant role (Bales, 2). Roberts’ relationship with his mother, on the other hand, was one that Roberts spoke of in his I Wanted to Write and in various essays (Bales, 2). The time spent with his mother’s family eventually served as the backdrop for his writings on Maine and his novels. Though Roberts’ characters surnamed Towne or Nason are fictional, they are based upon real people in Roberts’ past and illustrate his deep appreciation for his family’s history and for his beloved state of Maine.